David Smith doesn’t cut the figure of a man who’s been to prison, let alone one who spent more than a year in solitary confinement. Dressed in a button-up white shirt, with tan khakis and a blue blazer, the impression Smith gives is more of a white collar worker. 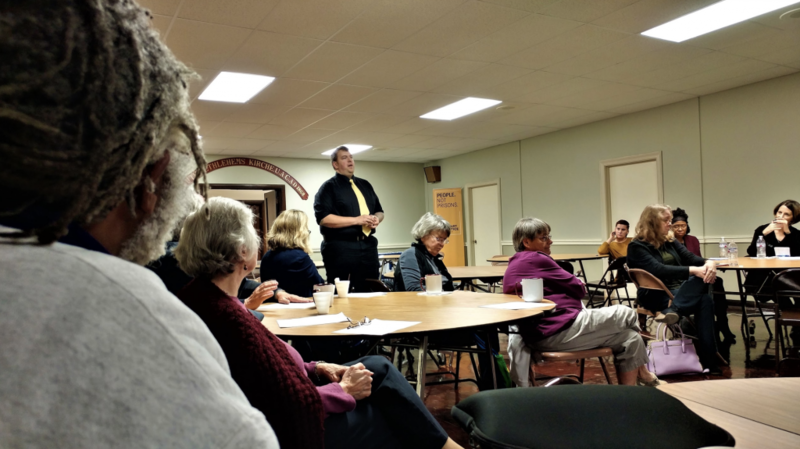 This impression isn’t out of place in the homely lower level of the Bethlehem Lutheran Church, which served as the setting for a forum on Virginia solitary confinement on October 27. For Smith, this misconception is one of many aspects of a long-standing issue that prison-reform advocates want the state to address. The report was preceded by a letter to Governor Ralph Northam calling on him to sign an executive order that would limit the practice in Virginia. This request was joined by more, urging for state action from multiple advocacy and religious groups in the weeks following the report’s publication. These came largely through the Interfaith Action for Human Rights (IAHR), a coalition whose member organizations reside in Virginia, Maryland, and Washington, and for which Smith serves as a representative. 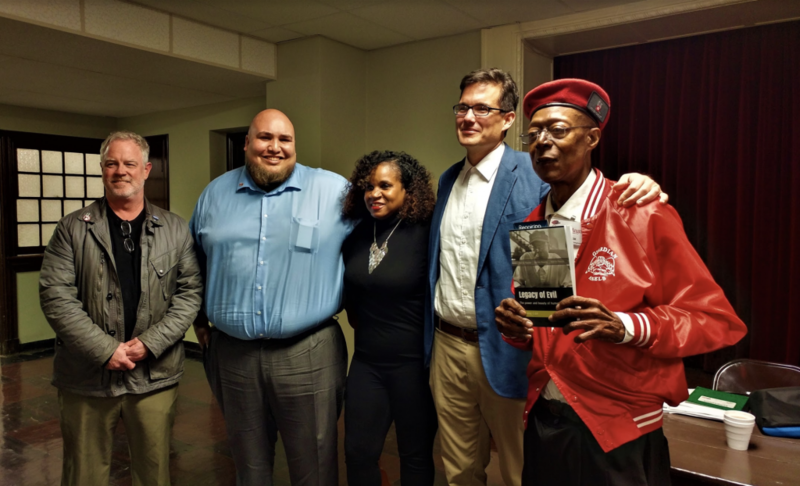 On October 27, Smith moderated a panel of speakers that included former inmate, author, and community advocate Tommy Cox; Jenkins-Snodgrass; and Bill Farrar and Mateo Gasparotto of ACLU-VA. Jenkins-Snodgrass was open about effects that “the United States’ best-kept secret” had for her son, Kevin D. Snodgrass Jr., his health, and a loving family. The details of the years Snodgrass says her son spent in solitary confinement are a far cry from the statements that the Virginia Department of Corrections (VADOC) has given in the past. They also contrast heavily with VADOC’s recent attempts to better the treatment of its prisoners. These include a 21-month initiative started in early 2017 with the Vera Institute of Justice, focused on reducing the use of what officials call “restrictive housing,” among other efforts. These statements and measures constitute some of the few pieces of public information available about the experiences of Virginia’s prisoners, something the panel repeatedly emphasized during the discussion. In the absence of more accessible research or data on the state of Virginia’s prisons and their treatment of offenders, groups like ACLU-VA & IAHR and individuals like Tommy Cox are more than willing to fill in the gaps. “The people that came to the cell were nasty. They talk to you any kind of way, you took one shower once a week, and it was living hell,” said Cox, who described the physical degradation he suffered as the result of the conditions in solitary across two incarcerations, totaling almost 40 years. Cox’s time included one confinement which lasted three consecutive years during a stint in a New Mexico prison as a Virginia offender, which made him the very first inmate in the Commonwealth to be shipped out of state. Other testimonies and criticisms ranged from the withholding of food by guards to the mental effects solitary confinement has on inmates and the lack of accountability present in the VADOC and other agencies. Even the measures taken by the VADOC to create easier pathways out of “restrictive housing,” namely the Administrative Step-Down Program instituted in 2012, were sharply criticized for resulting in harsher treatments for Hispanic and African-American inmates. “Their treatment is completely arbitrary, there’s no sense of cohesion, and there’s no sense of fairness or justice,” said Gasparotto, who has spoken with several inmates at the Wallens Ridge and Red Onion State Prisons. The latter was the focus of a hunger strike by prisoners in 2012 as well as an HBO documentary released in February. It is part of an investigation into prison abuse by Attorney General Claude Walker of the Virgin Islands. The solutions the panel recommended to help in solving this problem proved to be the same method that defined much of the discussion — speaking up against solitary confinement, and championing the humanity of those incarcerated. Audience members were asked to call their representatives. Lobbying by the ACLU-VA has already led to the introduction of a “reporting bill” into the Virginia House of Delegates ahead of the 2019 General Assembly by Patrick Hope, D-Arlington, that would, according to Farrar, “help us understand who is being held in solitary confinement, why, for what reason, for how long,” and lead to further legislative action. Efforts are underway to introduce similar a similar bill in the Senate, in addition to continued advocacy work focused on the Northam Administration. Delegate Hope was one of several people the speakers mentioned as “interested” in tackling the issue of solitary confinement — including legislators in both the Democrat and Republican parties — who “are waiting to see who will move first,” said Snodgrass. “Not everybody in the state government is turning a blind eye to this. There are advocates within the system,” Smith said. One of those advocates, Peter Wells, who ran as a Libertarian against A. Donald McEachin and Ryan McAdams in Virginia’s 4th District, was present to share his thoughts. Touting the prominence of criminal justice reform as part of his platform, Wells impressed on the audience the potential attention this issue would receive if his campaign made a strong impact in the midterms. While McEachin eventually claimed a sizable victory in last Tuesday’s midterms elections, with Wells pulling in around 1% of the overall vote, the then-Senatorial candidate was optimistic he would have the chance to bring the topic into a wider spotlight. As for Smith, he and other advocates are already looking ahead to next year’s local elections to establish connections with politicians sympathetic to their goals, regardless of party affiliation.